Norwegian Getaway Has Left The Building! Cruise News Norwegian Getaway Has Left The Building! Norwegian Getaway now in the final stages of construction. Norwegian Cruise Lines upcoming ship the Norwegian Getaway has been floated out of the construction dock in the Meyer Werft shipyard yesterday. The ship was being constructed in the shipyards large box like building and is now into the final stages of construction. Finishing touches are now being made and lots of tests. Crew members will also start setting up departments on the ship. Norwegian Getaway will be the sister ship to the very popular Norwegian Breakaway which launched earlier in the year. Norwegian getaway will be sailing out of Miami, Florida and the ships spaces will be dedicated to the sunshine state. The ship is 146,600 tons and can carry over 4,000 passengers. 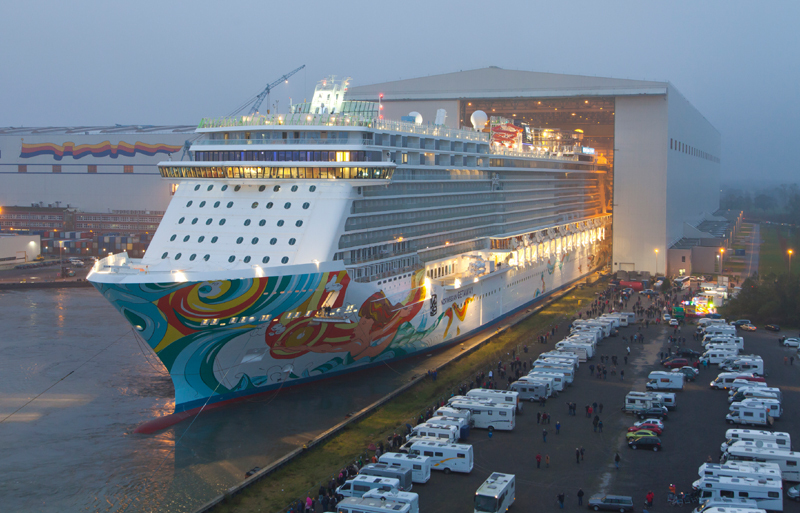 NCL Getaway also cost $780 Million to build at the Meyer Werft shipyard in Papenburg, Germany. If you missed the float out you can watch it here.